The luxury of sipping a simmering cup of coffee or sumptuous cocktail while musing over mood music at the nearest lounge after a hectic day at work is the latest fad. Influenced by the West, the ‘Coffee and Lounge Culture’ is picking up pace, not just in the metros but smaller towns too. The fact that the lounge and café culture is settling into the Indian retail sector is due to reasons that life has become hectic and stressful, be it in the business atmosphere or at educational centres. Retailers are banking on the fact that people look for peace and harmony, some turn to music, books, cocktails, food or just a good ambience. To draw luxury seekers almost every retailer is incorporating the lounge concept by providing its customers a private place to laze around. For example, tea companies have set up tea lounges and coffee retailers with coffee cafés. The lounge and cafe culture has finally come to India and has masses raving about it, be it bookshop cafes, tea lounges, music cafes or sports bar and lounges. 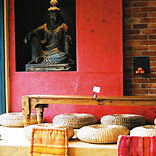 The idea and concept about such cafes is mainly targeting their clientele to spend money to relax and let go off stress. Coffee or liquor drinking at your favourite lounge or café may not be the same now since the Indian retailers have realised what the customers look for. In a bid to make sipping coffee a more wholesome experience, coffee retail companies such as Mochas or Barista are taking a step beyond the predictable. Café Coffee Day has entered into an alliance with Sony’s PlayStation. Sony PSP will be setting up kiosks across Café Coffee Day’s outlets in Mumbai, Bengaluru and Delhi. On the same, Alok Gupta, Director, Café Coffee Day says, “We are delighted to partner with Sony PSP one of the world’s most popular gaming brand. A diverse variety of age groups visit the café on a daily basis. This will enable our youth patrons to have an enhanced in-café gaming experience and help us in bringing greater value to our customers and yet again establishing our brand promise that ‘a lot can happen over coffee.” The trend of bookshops and cafes is just a small example of what retailers are aiming at. The biggest concern for a cafe and its success or lack is its apt location. A jukebox or a book counter can be set up anywhere as long as it works and makes its worth is essential. Locations like high street markets where the footfall is in great number is an ideal location, apart from that a preferred location is to where the target audience is found. College or work hubs are also an option retailers can look at. A perfect ambience allures masses into it. The interiors take a great deal while making a lounge, from the perfect colour of the walls to the right upholstery, a lounge takes in a lot of effort in making a place effortlessly cosy and welcoming. The retailer needs to be careful about how the ambience of a lounge or café is completed, whether the ambience is in accordance to what the café or lounge’s philosophy can make or break the retailer’s concept appeal to the masses. For instance, the set up of Hard Rock Café or Bikes and Barrels symbolises the idea behind the café’s philosophy. Whether a jukebox or a piano, a floor rug or a leather couch is required is an essential quality. By providing enchanting ambience and cosy couches retailers are raking in the moolah. Consumers can expect a lot more value addition to come along with that that cup of coffee or a recliner comfort in the future.